Subcom has been selected to supply and build a new H2 submarine cable system linking Australia and Hong Kong with direct access to China. The cable design also allows for a number of branching units that can be deployed to locations including Taiwan, Papua New Guinea, Solomon Island, Guam, Queensland, Hawaii and Los Angeles. A contract was signed at this week's SubOptic 2019 show in New Orleans. 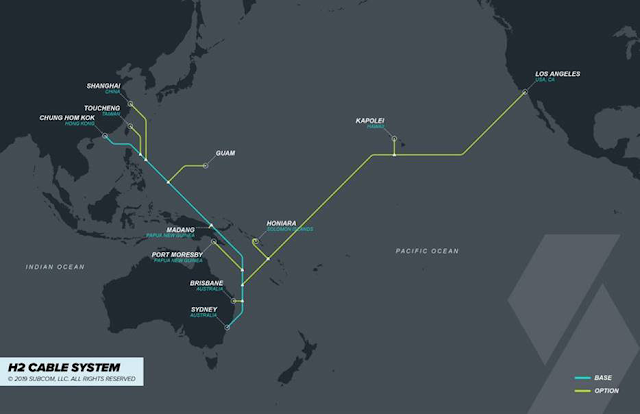 H2 will provide the lowest latency from Australia across the Pacific Ocean, with the Sydney to Hong Kong branch carrying 15 Tbps per fiber pair and the Sydney to Los Angeles branch carrying more than 12.9 Tbps per fiber pair. The cable has a single end power feeding capability of more than 13,000 km. The branch between Sydney and Los Angeles will follow an entirely diverse route to the north of New Caledonia, which has not been used by any other cable. 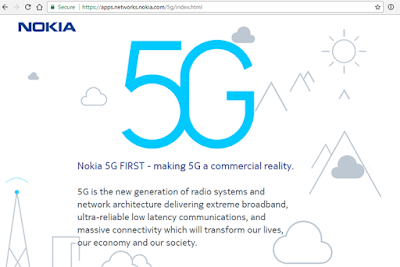 BT will be among the first operators in the world to deploy Nokia's 7750 Service Router (SR)-s platform to boost backbone network capacity in preparation for the continued rise in residential and mobile traffic driven by the traffic demands of FTTP and 5G. The Nokia 7750 SR-s will augment the existing Nokia 7750 SR and 7950 Extensible Routing System (XRS) it BT's network. Financial terms were not disclosed. Nokia described the deal as an exclusive agreement. The Nokia 7750 SR-s is powered by the company's multi-terabit network processor silicon (FP4). 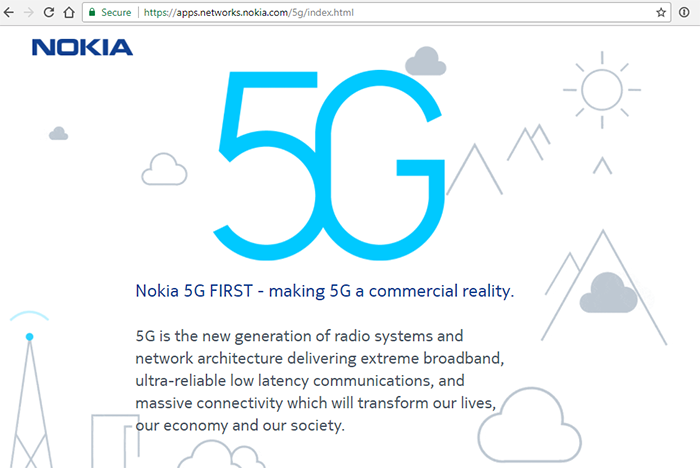 Nokia unveils its fourth generation network processing silicon for powering the first petabit-class core IP routers. The new FP4 silicon, which comes six years after the preceding FP3 chipset was announced, offers 2.4 Tb/s half-duplex capacity, or 6X more capacity than the current generation 400 Gb/s FP3 chipset. The FP4 will support full terabit IP flows. All conventional routing capabilities are included. Deep classification capabilities include enhanced packet intelligence and control, policy controls, telemetry, and security. The FP4 could be used to provide an in-field upgrade to Nokia’s current line of core routers and carrier switches. It will also be used to power a new family of 7750 SR-s series routers designed for single-node, cloud scale density. In terms of specs, the SR-s boasts a 144 Tb/s configuration supporting port densities of up to 144 future Terabit links, 288 400G ports, or 1,440 100GE ports. Absolute capacity could be double for a maximum of 288 Tb/s configuration. It runs the same software as the company’s widely-deployed systems. The first 7750 SR-s boxes are already running in Nokia’s labs. First commercial shipments are expected in Q4. Nokia is also introducing a chassis extension option to push its router into petabit territory. Without using the switching shelf concept employed in the multi-chassis designs of its competitors, Nokia is offering the means to integrate up to six of its 7750 SRS-s routers into a single system. This results in 576 Tb/s of capacity, enough for densities of up to 2,880 100GE ports or 720 400G ports. Google Cloud announced new archive class of Cloud Storage designed for long-term data retention as an alternative to tape storage. Pricing starts at $0.0012 per GB per month ($1.23 per TB per month). Access and management are performed via the same APIs used by Googles other storage classes, with full integration into object lifecycle management. Data in Cloud Storage is always redundantly stored across availability zones with 11 9’s annual durability. Google Cloud also announced the general availability of Cloud Filestore, a managed file storage system that’s built for high performance. Cloud Filestore’s premium instances will now provide increased read performance up to 1.2 GB/s throughput and 60k IOPS. NTT DOCOMO has selected Keysight’s 5G Conformance Toolset, part of Keysight’s 5G network emulation solution portfolio, to ensure 5G new radio (NR) mobile devices comply to the latest 3rd Generation Partnership Project (3GPP) standards prior to market introduction of new 5G services. Aquantia is collaborating Qualcomm Technologies on next-generation 5G NR fixed wireless access broadband equipment for high-speed Internet delivery to the customer premises. The consumer premises equipment (CPE) platform will feature the Aquantia AQtion Multi-Gig Ethernet Controllers AQC107 (10GbE) and AQC111C (5GbE), which can be used in conjunction with the Qualcomm Snapdragon X55 5G modem available from Qualcomm Technologies. The companies expect the first deployment in the United States in the first half of 2020. Aquantia has supplied samples of the reference design to early customers. The Aquantia AQtion AQC107 is a high-performance, 5-speed, 10 G PCI Express (PCIe)–to–Multi-Gig Ethernet controller that integrates PCIe, MAC, and PHY to provide power and space-efficient connectivity for client systems. An x4/x2/x1 PCIe interface enables the AQC107 to easily handle up to 10Gbps line-rate performance while delivering maximum flexibility. The AQrate PHY technology integrated into the AQC107 delivers up to 10 Gbps network connectivity speed through 100 m of Cat 6a and up to 5 Gbps network connectivity speed on legacy Cat 5e or Cat 6 cabling. The Aquantia AQtion AQC111C is a high-performance, Multi-Gig Ethernet controllers housed in a compact 9 x 9 mm package. Its ultra-small footprint and low-cost design makes it the perfect solution for embedded platforms as well as other PCIe LAN on Motherboard (LOM) implementations. By offering Multi-Gig Ethernet speeds of up to 5 and 2.5 GbE, Aquantia AQtion AQC111C offers flexible design options for a variety of networked devices including OEMs of consumer premises equipments, PCs and any device using a motherboards which to offer a seamless, Multi-Gig upgrade path. Versa Networks released a cloud-managed SD-WAN branch and security solution that simplifies the complexity associated with wide-area network transformation. The new Versa Titan, which is available through certified partners as a cloud-managed service, incorporates all core functionality of Versa Secure Cloud IP, Versa's fully integrated, cloud native, contextually-aware software stack. Versa Titan delivers offers cloud-based SD-WAN and software-defined security management tools via a Web browser that enhance visibility into security vulnerabilities, application behavior, network performance and bandwidth utilization. According to Mr. Mun, "5G Massive MIMO will have a profound impact on C-band small cell strategies, and we will see a shift to a new approach. Also, Private LTE and Edge Computing use cases will drive significant growth in the small cell market, with new customer groups aligning to drive growth. We also see substantial adoption for CBRS, LAA, and Wi-Fi connectivity in small cells as a low-cost way to add capacity." This report provides a high level view of how CBRS, LAA, Wi-Fi, and MIMO will play roles in the small cell market. Mobile Experts has published reports over the past year that dive into the deeper details of these technology areas, so the Small Cell report provides a business-level overview for all Small Cell deployment and how these features play into the overall HetNet.